Security guards stand watch over the house of a senior military officer who survived an assassination bid. Islamabad, Pakistan (CNN) -- The second assassination attempt in a week on a senior Pakistani military officer ended Tuesday in the nation's capital with a narrow escape by the officer. Gunmen on a motorcycle opened fire on the officer's vehicle in broad daylight as he drove with his mother to the bank from his house, Pakistani police said. "The passenger was a brigadier," said a senior Pakistani police officer, who spoke on condition of anonymity. "He was in his (civilian clothes) and he was on leave. ... fortunately, everybody is safe." The attack was another sign of the escalating conflict between the Pakistani government and the Taliban. Militants have launched a wave of suicide bombings, assassinations and raids on Pakistani cities this month, as the army presses its offensive against the Taliban stronghold of South Waziristan, in mountains along the Afghan border. Last Thursday, gunmen on motorbikes launched a similar attack, which succeeded in killing Brigadier Moinuddin Ahmed and another Pakistani soldier just blocks from the officer's house. Ahmed was commander of the Pakistani peacekeeping contingent in Sudan, at home on leave. Tuesday's assassins used tactics identical to those in last Thursday's shooting, police said. "It was the same thing. 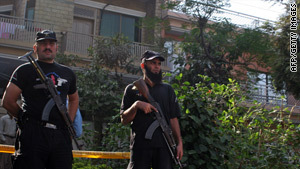 It was the same attack," the senior Pakistani police officer said. The gunmen escaped after the shooting, which took place just outside the targeted officer's house, police said. A manhunt was under way in nearby neighborhoods.